PCOS gives us a perfect example. Polycystic Ovarian Syndrome (or PCOS) is a hormone imbalance affecting between six and 10% of women. There are a number of medications that can be used to treat PCOS, but you might be surprised at how manageable the symptoms are naturally. For many women, PCOS is caused by an excess of androgens, which are male hormones such as testosterone. All women’s bodies make a small amount of these, but women with this form of PCOS produce too much. In these cases, women may experience acne, weight gain around the midsection, facial hair growth, and missed periods. For others, PCOS is caused by just the opposite: an excess of estrogen. Symptoms may include exaggerated PMS symptoms, long menstrual cycles with intense cramping, and infertility. 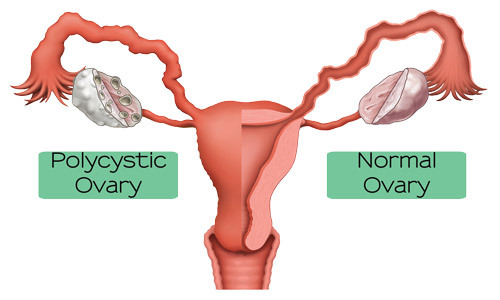 Many women with PCOS have chronic growths on their ovaries called ovarian cysts, which is what the condition is named after, but some women don’t experience this at all. Other symptoms may include high blood pressure, headaches, sleep apnea, or hair loss. The symptoms of PCOS run such a gamit that for many women, diagnosis is a long and confusing journey. The good news is that, because PCOS stems from hormone imbalance, many of the treatment options relate to diet and lifestyle and can be managed without a lifelong commitment to medication. The first step in managing PCOS is getting a complete hormone panel so you and your doctor can more clearly understand the imbalance your body is experiencing. While the specific treatment plan will be unique to you, it’s important for all women with PCOS to keep their adrenal glands healthy. Our adrenal glands, which reside just above our kidneys, produce hormones including cortisol and some androgens (including testosterone). Since the adrenals produce hormones, and since PCOS is caused by a hormone imbalance, keeping the adrenals healthy is especially important for women with this condition. One big piece of this is reducing stress. The adrenal glands produce cortisol, which is famously known as the stress hormone responsible for the fight-or-flight response. When we’re stressed, our adrenal glands produce cortisol, and if we’re stressed often, the glands have to keep up with production. Prolonged stress means the adrenals have to work hard to produce enough cortisol, which can be taxing on the glands. In essence, it’s important both to lower stress to keep the adrenal glands healthy, and to keep the adrenals healthy to lower stress. To regulate cortisol production, it’s recommended that women with PCOS (and in reality, everyone) lower stress by practicing relaxation techniques such as meditation, taking epsom salt baths, and spending time outside. Do what works for you! Cortisol is produced not only when we’re emotionally stressed, but when we’re physically stressed as well, for instance during exercise. Over-exercising, which is loosely defined as exercising for more than 60 minutes a day and/or doing so intensely, can actually be detrimental to the adrenal glands in that it demands a great deal of cortisol production. Instead, women with PCOS should engage in regular, moderate physical activity such as taking walks instead of running and doing restorative yoga instead of bootcamp classes. In addition to adjusting your exercise regime, paying close attention to your diet can have drastic effects on your PCOS symptoms. Dr. Sturm advocates that her PCOS patients adhere to an anti-inflammatory diet, which suggests eating mostly vegetables, fiber-rich fruits, healthy fats, lean protein, and whole grains. You may also supplement your diet with foods that have hormone-healing effects, such as spearmint tea, cinnamon, apple cider vinegar, bone broth, and adaptogenic mushrooms. Inflammatory oils (such as sunflower, corn, and vegetable oils), processed foods, and sugars should generally be avoided, and alcohol and caffeine consumption limited. Meat and dairy are controversial, but if you do incorporate them into your diet, eat organic: conventionally raised beef and dairy may contain residues of growth hormones that can throw your hormone balance off. Some women with PCOS experience insulin resistance as one of their symptoms. Simply put, their cells are unable to effectively absorb glucose, causing increased blood sugar. In addition to the risk of prediabetes and Type II diabetes, insulin resistance can also cause the ovaries to produce more androgen hormones, thus perpetuating the PCOS. To regulate insulin levels, it’s recommended that women with PCOS eat at regular intervals and especially first thing in the morning. Keeping your blood sugar stable is key. And of course, Dr. Sturm utilizes a variety of customized herbal prescriptions and supplements to treat patients with PCOS. A combination of DIM, evening primrose oil, peony and licorice, inositol, magnesium, and NAC have been helpful for many women. The selection and dosage of each herb varies by patient, so we recommend coming in for a consult rather than self-prescribing. Dr. Sturm also advises acupuncture to keep PCOS patients healthy. It helps to regulate hormone balance, stimulates ovulation and a regular menstrual cycle, and activates the parasympathetic nervous system (your rest and relax response) for those of us struggling with stress management and cortisol imbalance. If you think you have Polycystic Ovarian Syndrome or have been diagnosed already, please call us to make an appointment for a consult. We’d love to help you get on the road to wellness.